Click here to read my review of the second movie in Legendary Entertainment’s MonsterVerse, Kong: Skull Island. In what is obviously a backstory intended to lead into a potential movie franchise, we see the history of man-made atomic power, and the monsters that it awakened. Those bomb tests at Bikini Atoll in the 1950s? Attempts to get rid of early visitations by Godzilla (or his kin – more on that later). The story begins in the Philippines, where Dr. Serizawa and his assistant Vivienne Graham [Sally Hawkins] are called in to examine a collapse at an enormous pit mine. The thing is, the collapse revealed an extensive open cavern – that turns out to be the inside of the ribcage of gigantic, dead beast. Inside? Two apparent cocoons, one of which is empty. 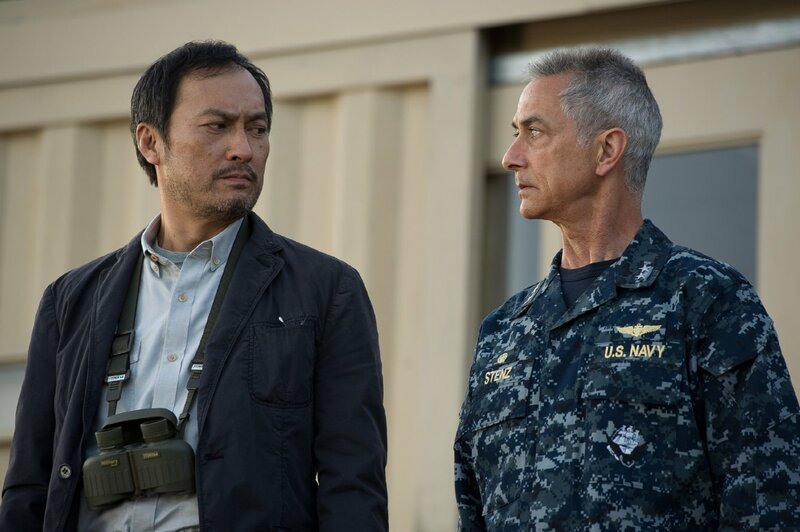 Graham asks Dr. Serizawa, “Is it him?” the “him” referring to the massive creature we saw the Americans trying to nuke in the opening credits. Whatever came out heads toward Japan, and coastal nuclear power plant. Joe Brody [Bryan Cranston, with a full head of hair] and his wife Sandra [Juliet Binoche] both work at the plant. He’s concerned because of a serious of seismic events that have been approaching the plant – events that seem strangely rhythmical, with no apparent epicenter. He demands that the plant be ramped down, his words falling on deaf ears – until a series of violent tremors begin to shake the whole thing apart. The plant is destroyed, and Brody barely survives, losing enough in the process to make it his life’s goal to find out what really happened. Jump forward fifteen years, and we meet Ford, Brody’s son, who is a Lieutenant in the Navy, a bomb disposal expert (technically, an EOD – Explosive Ordinance Disposal – specialist), and a father and husband in his own right. Before he’s able to settle in for a long awaited visit with his family, he gets a call – his father has been arrested for trespassing in a quarantine zone around the old power plant, and he has to go bail him out. Brody convinces his son to accompany him back to their old home, and they arrive just in time for the cause of the original destruction to awake once again – and enormous flying insect, quickly dubbed a M.U.T.O. (Massive Unidentified Terrestrial Organism) by the inevitable military leader (Admiral William Shanz [David Strathairn]) who shows up to take control of the situation. The rest of the movie takes us all the way across the Pacific, with stops in Honolulu, San Francisco, and Las Vegas. Godzilla movies are always about the mass destruction, and in that regard this movie does not disappoint. It’s always a visceral approach, and I have to admit it was somewhat disturbing to see the hotel I was staying at less than a month ago getting knocked down, full of families like mine on holidays. Director Gareth Edwards attempts to give the story a human scale, primarily through the focus on Ford’s family. It is far too easy to get into maudlin sentimentality when doing this (separated family members, children in peril), and the movie does venture into this territory, with foci on not one, not two, but three children in danger of separation and death – not to mention Ford himself as a child, when he faces the possible deaths of both his parents while watching the nuclear plant come down. 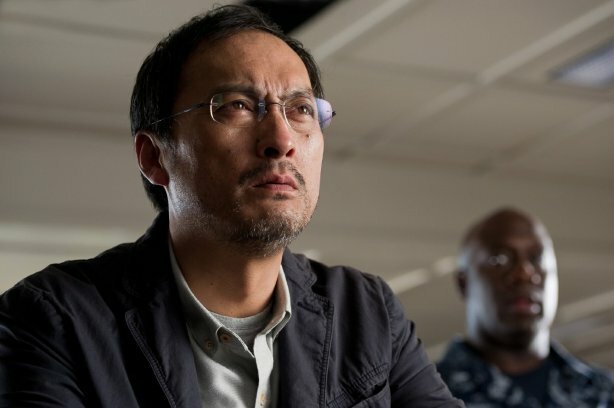 The main message of the movie is voiced by Dr. Serizawa, as he looks at the destruction wrought on one of the urban cityscapes visited by Godzilla. He turns to Admiral Stenz, who asks him what’s going to happen, and he replies, “The arrogance of man is thinking nature is in our control, and not the other way around. Let them fight.” This is, then, also a story of nature taking its vengeance on us. Unlike the original Godzilla, one that featured the monster as nature’s reaction to our nuclear testing, here he’s from a period in our history when nature itself was more radioactive – he’s a natural force around which we have very little influence. The reactions belong entirely to us, not to the monster. In the end, the film does find a balance between the human and monstrous scales, with an epic battle in an urban environment where the stakes are very high for thousands, not just a family or two. This movie does not suffer from the same problems the last American attempt at a Godzilla movie did, namely a cast and script that wasn’t sure if it was trying to be serious or funny, and a final act that owed too much to its chronological proximity to Jurassic Park, and its primary “monsters,” the velociraptors. Overall, not a perfect movie, but one that is entertaining, and does what it sets out to do: gives us a rousing monster movie that takes full advantage of the modern state of CGI, without overdoing the effects for effects’ sake. An entertaining monster romp in the grand tradition of Toho Studios, but with the only rubber suits being worn by nuclear scientists, rather than the monsters themselves.